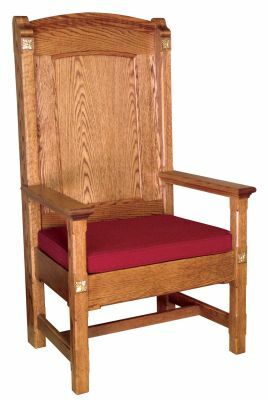 The frame is constructed of sustainable, American, solid red oak. The backs are made from veneer core plywood. The finishing process includes quality oil stains, hand rubbed. The final finishing coat is a semi-gloss lacquer. We offer 16 stain colours to chose from. We use the highest quality fabrics, tested for abrasion resistance and stain protected. Seating foams are high density, generally 2.6 lb. density with 45 – 48 lb. compression. Dozens of fabrics are available to meet your design requirements. Click the image tab above to view stain colours and fabrics.